It’s time to make pie. Actually, for a good life, make time every day to make pie. Spend half an hour mixing the cold butter pieces and various flours with a pinch of salt, dribbling in ice-cold water, letting it rest, rolling it out, and patting it, gently, into a pie pan. This time of year? There’s always something ripe and ready to fill a pie. (This one was a blueberry-lemon-thyme pie for Danny, on Father’s Day.) Let it bake. When you can smell the blueberries and thyme mingling, then gently insisting that you eat them now, check the pie. When that crust is golden brown and flaky, the purple juices spilling onto the parchment paper on the baking sheet  if you remembered to put the pie on it before you slid it into the oven  pull it out of the oven. Give a little sigh. You’ve just made a pie. You don’t have to eat pie every day. I suppose you probably shouldn’t. But if we all took the time to make a pie, every day, and walk over to our neighbors’ house with a warm pie just out of the oven? Can you imagine how much better we’d all know each other? How happy we could make each other? 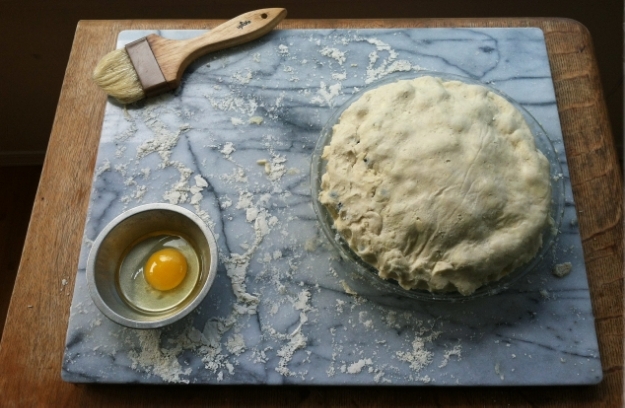 At the very least, you can make a pie this week, in time for Pie Party 2012. Some of you might remember that we did this last year. A conversation among bakers and people crazy about pie on Twitter led to a baking-together date, which led to a Facebook page, which led to over 1000 people making pie and posting about it on the same day. How can we not do it again? If you want to play along, all you have to do is make a pie. Any kind of pie. Cherry pie with a butter crust. Vegan chocolate pie. Apricot-nectarine pie with a leaf lard crust. Sweet pie. Savory pie. Gluten or not. Any kind of pie. And then, post your photo or blog post about the pie on the Pie Party 2012 Facebook page. Or, you can leave a record of your pie in the comments section of the post I will be publishing early Wednesday morning. We want to see your pies. We want to hear your stories about pie. Why are we doing this? It’s pie. Making pie is a way of slowing down. It’s a way of protesting our overly convenient, overly rushed society. Most people buy pies. Making a pie means you are here, trying. And there’s nothing to fear. I just taught a pie-making class at the Book Larder in Seattle. Most of the good folks in that class were scared of making pie when we began. I’m pretty sure they all left confident about their attempts by the end. Maybe it’s a metaphor. If you can calm down and let go of your fears, put your love into your hands as you crimp the crust, and just be here long enough to make a pie? Maybe you can do that in the rest of your life too. Or maybe it’s just pie. Because pie is a very good thing. So join us, won’t you? If you need a good gluten-free crust, here’s our favorite recipe. We can’t wait to see your pies on Wednesday. Oh I bake pies more than I bake anything…love to make pastry….right now rhubarb is the pie of choice, next will be strawberry but my husband considers apple his all time favorite. They really are not difficult and there is something good for the soul when you take a beautiful golden pie out of the oven. I make rolling pins in my wood studio, have to try out the different models…..hmmm that is my excuse.LOL I have many young bakers purchasing pins to start to make pastry. I think homemade pies be back in the desert menu for many kitchens. Oh… but I don’t know what KIND of pie. Dilemmas! So, June 20th is Pie Day? It would also have been my dad’s 82nd birthday and he LOVED pie! He always enjoyed teasing the waitresses by asking them to recite the pie list… again…just one more time. I’m definitely making pie on June 20th. Happy Pie Day, Dad!! How perfect is the timing on this post? My friends and I just finished making strawberry-rhubarb pie a few hours ago. And we all agree, it’s probably the best pie we’ve ever had. Friends make everything better. I make pie , oh maybe once a year! I know, embrassing! I will try to do better this summer. Thyme and lemon pie sounds different and interesting enough that I will try it. This made my mouth water. Pie has been one of the most challenging things for me to recreate as a gluten-free favorite because I’m grain free and egg free. However, I love pie with a nut meal crust (can be almond or walnut or whatever) and I’m working on a buckwheat (which isn’t a cereal grain) crust. Cross your fingers for me! I, too, would love to have the recipe for the filling for your blueberry, lemon, thyme pie. How perfect! This is a woman in our area who has made a pie a day for a year and given them away. Pies do make people happy! This post makes me hungry. 🙂 I would love to try making a gluten free pie for my hubby. Yay for pie! I can’t wait to see what everyone comes up with! Love love pie! It’s so much fun trying new recipes. Now with strawberries in season, I’m making a gluten-free Rustic Strawberry Crostata. I alter this recipe according to whatever berry and fruit is in season. Can’t wait to see all the contributions on Happy Pie Party! This is such a fun idea! We love getting to many gluten free-ers involved in the same event, all centered around delicious gluten free baking! We can’t wait to see all the beautiful pictures and mouth-watering recipes! I’m a little late to the pie party, but I am making an apple pie for the fourth of July, which is the first pie I have ever made and it has been 8 years since I have had a slice of pie. I keep reading your words from your last post – it is not a time bomb, it is pie and not to fret. Thanks for the confidence! I made an apple pie the other day, using your recipe… it was WONDERFUL. I have made some pretty disastrous gluten-free pies in recent years, and this one has convinced me that I need to keep trying, keep making them, they are possible. To me the only thing that requires improvement (on my pie, not your recipe) is the “bite”. My pie was a little… tough/crunchy on the edges where it was fluted. I think I need to roll my dough a little thinner, but the taste… was fabulous!! Thank you so much for your wonderful recipes and ideas! I have never really been into pie, but after this recipe, all I can talk about is pie. I made it with Earth Balance yesterday, and I couldn’t believe how well it turned out. Flaky, buttery, tender…. amazing. I’m trying it with real butter on Tuesday for a dinner with some friends. I also finally, FINALLY got around to making the Ahern Gluten-Free flour mix, and I wish I had done it eons ago. Thank you for going through the hard work and all of the trial and error to make this mix. I’m so excited to start trying more baking recipes now that I know I have a really dependable flour mix.